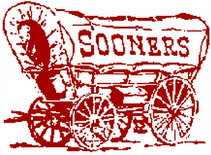 In Week 2 of the NCAA football polls, Oklahoma is now rated #3! It's going to be hard to live with you, isnt' it? The Gators are right behind you! They had a pretty good score by the end of their game with the Hurricanes, but the first three quarters were definitely NOT a blow out! I watched the game and was rooting for the Gators the whole time. I was a bit conflicted because you guys are right behind us, but everyone hates Miami, right? Why the "boo?" Your Raiders won, didn't they?